Generally speaking, this time of year is the busiest for Rabbanim the world over; fielding questions on every aspect of the myriad and complex halachos of Pesach observance. Yet, interestingly, the question that often seems to be utmost on people’s minds is not about chometz or even cleaning properly. No, the biggest issue during the ‘Pre-Pesach Rush’ in recent years seems to be whether quinoa (pronounced Keen-Waah) is considered kitniyos and whether Ashkenazim can eat it on Pesach. Perhaps, it has something to do with the fact that the U.N. declared 2013 as the ‘International Year of the Quinoa’. Whatever the reason, after receiving this question numerous times in one day, this author decided to thoroughly examine the issue. Quinoa has developed an international following. Packed with protein (essential amino acids) and fiber, as well as magnesium, phosphorus, calcium and iron (and, naturally, cholesterol free! ), quinoa packs quite a dietary punch. Although billed as the ‘Mother of All Grains’ and ‘the Super Grain’, this native of the Andes Mountains (think Bolivia and Peru) is actually a grain that isn’t; it does not even contain gluten. It turns out that quinoa is really a member of the ‘goose-foot’ family (Chenopodium), related to beets and spinach. However, while its health benefits sound terrific, it still may be problematic on Pesach. It is well known that the actual prohibition of chometz on Pesach pertains exclusively to leavened products produced from the five major grains: wheat, barley, oats, spelt, or rye.Yet, already in place from the times of the Rishonim,there was an Ashkenazicprohibition against eating kitniyos (legumes; ostensibly based on its semi-literal translation: ‘little things’) on Pesach, except in times of famine or grave need.Although several authorities opposed this prohibition,nonetheless it is binding on Ashkenazic Jewry in full force, even today. Although referred to slightly differently by our great luminaries, i.e. the Kitzur Shulchan Aruch references the kitniyos restrictionas an ‘issur’, the Mishnah Berurah as a ‘chumrah’, the Aruch Hashulchan as a ‘geder’, Rav Tzvi Pesach Frank zt”l as a ‘gezeirah’, Rav Moshe Feinstein zt”l as a ‘minhag’, and the Klausenberger Rebbe zt”l as a ‘takanah’, nonetheless, they all maintain that thekitniyos prohibition is compulsory on all Ashkenazic Jewry.In fact, the Aruch Hashulchan avers that ‘once our forefathers have accepted this prohibition upon themselves, it is considered a ‘geder m’din Torah’ and one who is lenient is testifying about himself that he has no fear of Heaven”. He adds, echoing Shlomo Hamelech’s wise words in Koheles regarding a ‘poretz geder’, that one who breaks this prohibition deserves to be bitten by a snake. Several reasons are given for the actual prohibitionincluding that kitniyos often grow in close proximity to grain; are commonly stored together with grain and actual chometz might actually end up mixed inside the kitniyos container; cooked dishes made from grain and kitniyos look similar; and that kitniyos can likewise be ground up into flour - a ‘bread’ of sorts can actually be made from them. Since there are many who will not be able to differentiate between them and their Biblically forbidden chometz counterparts, kitniyos was likewise prohibited. Potatoes, Peanuts, and Corn…Oh My! So how does our quinoa measure up? Although it has been used in the Andes for millennia, it has only recently gained popularity around the world. Does quinoa fit the kitniyos criteria or not? Perhaps we can glean some insight to quinoa’s kitniyos status from halachic precedents of other now-common food staples that were introduced long after the kitniyos prohibition started, such as potatoes, peanuts and corn. It would seemingly be quite difficult for anyone to mix up potatoes with chometz grain, so that rationale to regard potatoes as kitniyos is out. But, potatoes can be and are made into potato flour and potato starch, and there are those who do bake potato ‘bread’! If so, why would potatoes not be considered kitniyos? According to this, shouldn’tthey be forbidden for Ashkenazim to partake of on Pesach? In fact, and not widely known, the Chayei Adam seemingly considered potatoes kitniyos, and the Pri Megadim mentioned that he knows of such a custom, to prohibit potatoes on Pesach as a type of kitniyos.However, the vast majority of authorities rule that potatoes are not any form of kitniyos and are permissible to all on Pesach. One of the main reasons for this is that at the time when the Ashkenazic Rishonim established the decree prohibiting kitniyos, potatoes were completely unknown! It is possible that had they been readily available they might have found themselves on the “forbidden list” as well! Yet, since they were never included, as well as do not fit most of the kitniyos criteria, contemporary authorities could not add “new types” to the list. However, it must be noted that there are other important reasons as well why potatoes were excluded. Of the four criteria given for the Gezeira of kitniyos, potatoes only fit one, that it can be made into flour and a ‘bread’ of sorts can be baked from it. No one would mix up a potato with a grain kernel! As Rav Shlomo Zalman Auerbach zt”l noted,Klal Yisrael never accepted the kitniyos prohibition to include potatoes. We find that similar ‘New World’ logic was used by several Poskim, including Rav Moshe Feinstein zt”l, to permit peanuts for Pesach for those who did not have an opposing minhag. Yet, this was not as widely accepted since peanuts, a true legume, and as opposed to potatoes, can get mixed up with grain. In fact, the minhag in Yerushalayim (dating back at least several centuries) is to consider both the peanut and its oil kitniyos. On the other hand, we find that another New World crop, corn, was seemingly unanimously included as part of the kitniyos prohibition. Aside for the fact that the words ‘corn’ and ‘grain’ both stem from the same root, ‘corn’ is actually only the name for the grain ‘maize’ that is used in the United States, Canada, and Australia. In other parts of the English-speaking world and much of Europe, the term ‘corn’ is a generic term for cereal crops, such as real chometz - wheat, barley, oats, or rye. In fact, the infamous British Corn Laws (1815 - 1846) were concerning wheat and other grains, not corn! Additionally, corn exhibits many characteristics of real deal kitniyos: it grows near other grains, has small kernels, is made into flour (that can be easily confused with grain flour), and corn bread is made from it. Therefore, since corn fits much of the criteria of kitniyos, as opposed to potatoes, it was included in the prohibition. All this said, which category should quinoa be a part of? Like the potato and be excluded from the prohibition? Or like corn and be considered kitniyos? Actually, contemporary authorities and Kashrus agencies have been debating just this very question. It turns out that quinoa is halachically similar to the peanut, meaning that its status is debated. Several major American Kashrus agencies, including the Star-K, who follow the psak of Rav Moshe Heinemann, and the cRc (Chicago Rabbinical Council), following the psak of Rav Gedalia Dov Schwartz, as well as the Kof-K, maintain that quinoa is essentially Kosher for Pesach. Since it is not even remotely related to the five grains, (in fact, it is also not a legume and not botanically related to peas and beans, which are of the original species of kitniyos included in the decree) and was not around at the time of the kitniyos prohibition, it is not considered kitniyos. Additionally, the Star-K tested quinoa to see if it would rise, yet instead, it decayed, a sure sign that it is not a true grain. The only issue, according to them, is the fact that quinoa is processed in facilities that other grains are processed in. Therefore, they maintain, if quinoa is processed in facilities under special reliable Pesach supervision, there is no Pesach problem. In fact, every year since, the Star-K has given special kosher for Passover hashgacha on certain types of quinoa. However, Rav Yisrael Belsky zt”l, Rosh Yeshiva of Torah Vodaas and chief Posek for the OU disagreed. He argued that since quinoa fits every criterion for kitniyos, it should be included in its prohibition. Quinoa is the staple grain in its country of origin. It is grown in proximity of and can be mixed up with the five grains. It is collected and processed the same (and in the same facilities) as the five grains, and is cooked into porridge and breads the same as the five grains. He maintained that it should be compared to corn, which was, for similar reasons, included in the kitniyos prohibition. Although quinoa is a New World food item and was not included in the original prohibition, nevertheless, he explained that that line of reasoning applies exclusively to items that are not clearly kitniyos, to foods that may share only several characteristics with kitniyos. However, since quinoa and corn would certainly have been included in the Gezeira had they been discovered, as they share every criterion of kitniyos, they are consequently by definition considered kitniyos. This stringent view is shared by Rav Dovid Feinstein, Rav Osher Yaakov Westheim of the Badatz Igud Rabbanim of Manchester, and Rav Shlomo Miller of Toronto, among other well-known Rabbanim. On the other hand, the OU’s other main Posek, Rav Herschel Schachter, Rosh Yeshivas Rabbeinu Yitzchak Elchanan (Y.U. ), permits quinoa, concluding that if it processed in a special facility with no other grains, it should be essentially permitted for Passover use. Due to the difference of opinions of their top Poskim, until fairly recently, the OU did not certify quinoa as Kosher for Pesach. However, in late 2013, the OU made a decision allowing quinoa for Pesach, provided that it is processed with special Passover supervision. In fact, the OU recommended quinoa for Pesach 2014 and actually started certifying special Pesach processing runs. This certification continued for Pesach 2015, and currently the OU continues to grant special Pesach supervision annually for quinoa. However, not every Kashrus agency in North America agrees with their permissive ruling. The OK does not certify quinoa for Pesach as they consider it kitniyos, as does the Hisachdus HaRabbanim (CRC), as well as the COR of Toronto. This also is the Badatz Eidah Hachareidis of Yerushalayim’s approach, as in their annual Madrichei HaKashrus, they maintain that food items that are planted in the ground as seeds (zironim), harvested as seeds (garinim) and are edible, are considered kitniyos. As mentioned previously, the Yerushalmi Mesorah for this goes back centuries. They therefore definitively classify quinoa as kitniyos. Other Poskim who ruled similarly include Rav Yosef Shalom Elyashiv zt”l, who ruled that quinoa should be considered kitniyos after being shown it and hearing from representatives of various kashrus agencies, and Rav Asher Weiss (the renowned Minchas Asher), who recently addressed this topic in his weekly halacha shiur, as well as in several responsa (including one to this author; posted at the end of this article), and concluding that it is indeed kitniyos. This is also the opinion of Rav Yehoshua Yeshaya Neuwirth zt”l, venerated author of Shemiras Shabbat Kehilchasa, Rav Yaakov Ariel of Ramat Gan, and Rav Mordechai Najari of Ma’aleh Adumim. Similarly, the current Ashkenazic Chief Rabbi of Israel, Rav Dovid Lau, wrote that quinoa is only permitted on Pesach for ‘Ochlei Kitniyos’. This also appears to be the Israeli Rabbanut’s position as well. Additionally, the largest Sefardic kashrus agencies in Israel, the ‘Beit Yosef’ and Rav Shlomo Machpud’s ‘Yoreh Deah’, although giving hashgacha on quinoa for Pesach, both qualified that it is reserved exclusively for ‘Ochlei Kitniyos’, squarely calling quinoa kitniyos. In light of all this, in addition to the Badatz Eidah Hachareidis’s prevailingapproach of following the Yerushalmi Mesorah based on the Talmidim of the Vilna Gaon, it seems much less likely to see quinoa gracing Pesach tables in Eretz Yisrael. Rav Avraham Blumenkrantz zt”l, in his annual Kovetz Hilchos Pesach, took a middle road approach, acknowledging both sides to this quinoa quarrel. He did not give carte blanche for everyone to use it for Pesach, but concluded that anyone who suffers from gluten or any Pesach-related allergies or conditions (ex. celiac) may comfortably use quinoa on Pesach without hesitation. This is also the opinion of Rav Dovid Ribiat, author of ‘The Thirty-Nine Melachos’, as well as the view of the London Beis Din (KLBD). Rav Mordechai Tendler, grandson of Rav Moshe Feinstein zt”l and author of Mesores Moshe, told this author that this is the approach that he felt his venerated grandfather would have taken and not (as many mistakenly opine) that Rav Moshe zt”l would have permitted it outright, had quinoa been introduced while he was still alive. In this author’s estimation, the point Rav Tendler was making is that there seems to be a common misconception that Rav Moshe Feinstein zt”l, in his oft-cited teshuva defining peanuts’ kitniyos status gave a blanket hetter for any ‘New World’ food item. In this author’s opinion, this is not entirely correct, as was mentioned previously that everyone considers corn as kitniyos, even though it was introduced long after the kitniyos restriction. Rather, Rav Moshe used that as a sevara (and he was neither the first nor the only Posek to do so) to explain why potatoes were not included in the restriction, as well as peanuts for those who did not have an existing minhag. Meaning, Rav Moshe held that minhag and similarity to all kitniyos factors also play an important role in classifying kitniyos; ergo, he did not intend to give a carte blanche hetter for every ‘new food’. As such, Rav Tendler was relating, it would seem tenuous at best to apply that teshuva as the exclusive basis to a hetter permitting quinoa for Pesach. This is also the understanding of his uncle, Rav Moshe’s son, Rav Dovid Feinstein, as well as his father and Rav Moshe’s son-in-law, Rav Moshe Dovid Tendler; both whom do not recommend Ashkezaim eating quinoa on Pesach. In fact, this is explicitly written as Rav Moshe’s shittah in the recently published Mesores Moshe vol. 2, that Rav Moshe related that although corn is also a New World food item, it was nonetheless added to the restriction as it fits many of the same criteria of the prohibited kitniyos, as opposed to potatoes and peanuts. It seems that there truly is no quiet clear-cut conclusion to this contemporary kashrus controversy. Can one eat it on Pesach? One must ask his own personal, local halachic authority for guidance to clear up any quinoa / kitniyos kashrus confusion or questions. All else equal, in this author’s mind one thing is certain regarding a holiday that is all about Mesorah and tradition: quinoa was not served at Bubby’s Seder! This article was written L’Iluy Nishmas Yisrael Eliezer ben Zev a"h - my dear Great-Uncle Larry Spitz, who was niftar this month, L’Zechus for Shira Yaffa bas Rochel Miriam v’chol yotzei chalatzeha for a yeshua teikif umiyad, and l’Refuah Sheleimah for Shoshana Leah bas Dreiza Liba, Mordechai ben Sarah, and Shayna bas Fayga. Rabbi Yehuda Spitz, author of M’Shulchan Yehuda on Inyanei Halacha, serves as the Sho’el U’Meishiv and Rosh Chabura of the Ohr Lagolah Halacha Kollel at Yeshivas Ohr Somayach in Yerushalayim. He also writes the ‘Insights Into Halacha’ column for Ohr Somayach’s website: https://ohr.edu/this_week/insights_into_halacha/. For questions, comments, or for the full mareh mekomos, please contact the author at yspitz@ohr.edu. Mishnah Pesachim (Ch. 3: 1), Gemara Pesachim (42a - 43a), Rambam (Hilchos Chometz U’Matzah Ch. 5: 1). These are also the only grains with which one may fulfill his obligation of Achilas Matzah - see the Mishnah in Pesachim (35a), Rambam (Hilchos Chometz U’Matzah Ch. 6: 4), and Tur and Shulchan Aruch (O.C. 453: 1). See for example Mordechai (Pesachim 588), SMa”K (222), Ra’avad (Hilchos Chometz U’Matzah Ch. 5: 1), Hagahos Maimoniyos (ad loc. ), Ohr Zarua (vol. 2: 256, pg. 59, 3rd column), Rabbeinu Manoach (on the Rambam ad loc. ; cited in Biur Halacha 453: 1 s.v. v’yeish), Maharil (Minhagim, Hilchos Maachalos Assuros B’Pesach 16), Terumas Hadeshen (113 and 133), Ritva (Pesachim 35a s.v. hani), and Tur (O.C. 453). Not that they all upheld the prohibition of kitniyos, but they all mention it. See also the Pri Megadim’s Introduction to Hilchos Pesach (vol. 2, Ch. 2: 6) and the Chida’s Tov Ayin (18). The Rambam (Hilchos Chometz U’Matzah Ch. 5: 1) explicitly permitted kitniyos, the Ritva (Pesachim 35a s.v. hani) writes that the ‘minhag pashut b’chol Sefard’ is to eat cooked rice on Pesach, and even the Beis Yosef (O.C. 453) refers to it as a strictly Ashkenazic issue. Interestingly, and although not me’ikar hadin, there are some Sefardim who are stringent as well, especially with rice – on this topic, see Knesses Hagedolah (O.C. 453, Hagahos al HaTur 2; citing the Mahar”i Halevi 38), Pri Chodosh (ibid. ), the Chida’s Tov Ayin (9: 6), Shulchan Melachim (O.C. 453: 1), Ben Ish Chai (Year 1, Parashas Tzav 41), Shu”t Rav Pe’alim (vol. 3, O.C. 30),Kaf Hachaim (O.C.453: 10),Shu”t Yabea Omer (vol. 5, O.C. 37: 5), Shu”t Yechaveh Daas (vol. 1: 9), Shu”t Ohr L’Tzion (vol. 3, Ch. 8: 15), Rav Mordechai Eliyahu’s Darchei Halacha glosses on the Kitzur Shulchan Aruch (117: 2), Chazon Ovadiah (Hilchos Pesach, pg. 82 - 86), and Yalkut Yosef (Kitzur Shulchan Aruch O.C. 453: 1). The Ben Ish Chai adds that in his opinion one who is machmir not to eat rice on Pesach may not cook nor even serve rice to someone who does. [However, see Sdei Chemed (Maareches Chametz U’Matzah 6: 6) and Kaf Hachaim (O.C.453: 16) for alternate views.] The Kaf Hachaim (ad loc. 10) cites the Pekudas Elazar (51, pg. 64b) who writes that in his day, the Sefardim in Yerushalayim were noheg to prohibit kitniyos. [However, the Kaf Hachaim adds that by his time that was no longer the case, but rather each Kehillah kept its own minhagim.] In a similar vein, seemingly regarding Sefardim and kitniyos, Rav Avraham Azulai zt”l, ancestor of the Chida, in his Kabbalistic sefer Maaseh Choshev (which was first printed from a manuscript in 5752; end Rimon 13, B’Inyan Chag HaPesach V’Yetzias Mitzraim s.v. matzasi) writes briefly that he found written in the name of the Arizal, ‘Shekol Hamishamer Pesach Karui B’chol Inyanav Shehu To’eles L’Nefesh L’chol Hashana, V’Hachaveirim (a term generally used to refer to the Arizal and his talmidim) Hayu Machmirin K’Minhag Ashkenazim, ad kan matzati”. Thanks are due to to my talmid, R’ Yitzchak Rubin, for pointing out this fascinating source. Chayei Adam (vol. 2, 127: 1; and Nishmas Adam, Hilchos Pesach Question 20), Mor U’Ketziah (beg. O.C. 453), Shu”t Teshuva M’Ahava (259), Shu”t Chasam Sofer (O.C. 122), the Maharatz Chiyus’s Kuntress Minchas Kina’os (6; printed in Kol Sifrei Maharatz Chiyus, vol. 2, pg. 1029), Mishnah Berurah (453: 7 and Shaar Hatziyun 6), and Aruch Hashulchan (ad loc. end 5). For a discussion on what is considered great need in order to allow kitniyos, see Shu”t Zeicher Yehosef (O.C. 157), Shu”t Shoel U’Meishiv (Mahadura Tinyana vol. 4: 128) and Shu”t Divrei Malkiel (vol. 1, 28: 20). On the other hand, the Vilna Gaon is quoted (Maaseh Rav 184) as being extremely makpid with kitniyos, even ‘B’Shnas B’tzores’. As mentioned previously, the Rambam (Hilchos Chometz U’Matzah Ch. 5: 1) explicitly permitted kitniyos. See also Beis Yosef (beg. O.C. 453), quoting and Rabbeinu Yechiel and Rabbeini Yerucham, who called the kitniyos prohibition a “minhag shtus, ridiculous custom”. The prohibition is also strongly rejected by the Tur (O.C. 453), who writes that abstaining from rice and kitniyos on Pesach is a “chumrah yeseirah, v’lo nahagu kein”. The Yaavetz (Mor U’Ketziah beg. O.C. 453), quoting his father, the great Chacham Tzvi, famously declared that if he had the ability to cancel the kitniyos prohibition he would, as it mostly affects the poor. The controversial sefer Shu”t Besamim Rosh (348) even posits that the kitniyos prohibition was started by Karaites (!) and should not be followed. On the other hand, several authorities, including the Beis Meir (O.C. 453), Shaarei Teshuva )ad loc. 1), and Maharsham (Daas Torah ad loc. 1) counter his words, with the Maharsham emphatically declaring that ‘ain lanu ela minhageinu, v’chalilah lishmoa eilav’. He then cites the Maharil (Minhagim, Hilchos Maachalos Assuros B’Pesach 16, quoting the Maharash; also cited by the Shaarei Teshuva) that anyone who transgresses the prohibition of kitniyos, ‘d’kol d’gazru Rabbanan ha’over alav chayav misah, v’over al lo sasur min hadavar asher yorucha’. Rema (O.C. 453: 1 and Darchei Moshe ad loc. 2), Levush (ad loc. 1), Bach (ad loc.) Pri Chodosh (ad loc. 1; he cites a mekor from the Gemara - Pesachim 40b), Gr”a (Biur HaGr”a ad loc. and Maaseh Rav 184; citing the same source), Shulchan Aruch Harav (O.C. 453: 3 - 5), Chayei Adam (vol. 2, 127: 1), Shaarei Teshuva (ad loc. 1), Kitzur Shulchan Aruch (117: 4), Mishnah Berurah (453: 6 and Biur Halacha ad loc. s.v. v’yesh), and Aruch Hashulchan (453: 4 and 5). See also the Maharsham’s Daas Torah (ad loc. ), the Chida’s Tov Ayin (18), as well as the Maharatz Chiyus’s Kuntress Minchas Kina’os (6; printed in Kol Sifrei Maharatz Chiyus, vol. 2, pg. 1029), Shu”t Chasam Sofer (O.C. 122), Shu”t Tzemach Tzedek (Hachadoshos; O.C. 56), Shu”t Maamar Mordechai (32), Shu”t Maharam Brisk (48), and Shu”t Divrei Malkiel (vol. 1: 28), all of whom discuss the strength of this compulsory prohibition. Rav Elazar Flekles (Shu”t Teshuva Mei’ahava, vol. 2, on O.C. 459), prime disciple of the Noda B’Yehuda, avers rather strongly, that there is not a Beis Din in the world that can abolish the kitniyos prohibition, not even that of “Shmuel HaRamasi v’Eliyahu (HaNavi) u’Beis Dino,v’chol Gedolei Yisrael af imaheim”, since it was already accepted “b’chol arei Ashkenaz, Tzarfas, Polin – Gadol V’Kattan, Lita, Russia… Ungaren…”, etc. Kitzur Shulchan Aruch (117: 4), Mishnah Berurah (453: 6), Aruch Hashulchan (ad loc. 4 and 5), Rav Tzvi Pesach Frank (Mikra’ei Kodesh, Pesach vol. 2, 60: 2), Rav Moshe Feinstein (Shu”t Igros Moshe O.C. vol. 3: 63), and the Klausenberger Rebbe (Shu”t Divrei Yatziv O.C. vol. 2: 196). See Beis Yosef and Rema (O.C. 473: 1) and major commentaries, including the Biur HaGr”a (ad loc. 5), Shulchan Aruch Harav (ad loc. 3, 4, and 5), Chok Yaakov (ad loc. 5 and 6), Shaarei Teshuva (ad loc. 1), and Mishnah Berurah (ad loc. 6, and Biur Halacha ad loc. s.v. v’yesh). This author was recently interviewed on the ‘Kashrus on the Air’ radio show, discussing the topic of kitniyos and potatoes, as well as whether quinoa should be considered kitniyos. A recording of this show may be accessed at:https://soundcloud.com/jroot-radio/yosef-wikler-apr-07?in=jroot-radio/sets/kashrus-on-the-air. The Chayei Adam (Nishmas Adam, Hilchos Pesach, Question 20) tells a Maaseh Shehaya that in the city of Fiyorda (Fürth), Germany in 5531 - 5532, due to starvation conditions their Beis Din allowed them to eat potatoes on Pesach those years, although they normally forbid it due to potato flour being produced there; see also Chayei Adam (vol. 2, 127: 1), where he avers that the biggest kitniyos issue is the potential for flour mix-up with grain flour. The Pri Megadim (O.C. 453, M.Z. 1) mentions that he knows of such a minhag, nevertheless the vast majority of Poskim, including the Pri Megadim himself (O.C. 464, E.A.1) rule that potatoes are not considered kitniyos.See next footnote. The vast majority of Poskim, including the Pri Megadim himself (O.C. 464, E.A. 1), rule that potatoes are not considered kitniyos. Others who explicitly write that potatoes are not kitniyos include the Shu”t Sheilas Yaavetz (vol. 2: 147, 4 s.v. u’vhiyosi), Shu”t Divrei Malkiel (vol. 2: end 112; he adds an additional reason to be lenient: potato flour doesn’t look like grain flour and has a different consistency, therefore mitigating potential mix-ups), Shu”t Yad Aharon (16: 5), Aruch Hashulchan (O.C. 453: 5; he adds that with the advent of potatoes one should never have to rely on the hetter of permitting kitniyos b’shaas hadchak), Shu”t Levushei Mordechai (O.C. vol. 1: 127), Kaf Hachaim (O.C. 453: 21), Shu”t Igros Moshe (O.C. vol. 3: 63), Halichos Shlomo (ibid. ), Shu”t VaYaan Yosef (Mishpatecha L’Yaakov,O.C. 41), and Shu”t Chelkas Yaakov (new edition, O.C. end 207). It is widely quoted that the famed Divrei Chaim of Sanz questioned how the Chayei Adam could possibly have forbidden potatoes on Pesach when his sefer is titled ‘Chayei Adam’, literally ‘the Life of Man’ and potatoes are one of the necessities of life. Indeed, according to the Tiferes Yisrael (Avos Ch. 3: Mishnah 14, Boaz Beg. 1), this act of Sir Francis Drake’s, of introducing potatoes to the European continent, merited him to be classified as one of the Chassidei Umos Ha’Olam, as over the centuries potatoes have saved countless lives from starvation. Others included in this exclusive list include Johannes Guttenberg, who invented the printing press and thus enabled the disseminating of Torah on a mass scale, Johann Reuchlin, who defended the Talmud from being burned in numerous debates against the apostate Pfefferkorn, and Edward Jenner, creator of the modern smallpox vaccine, saving ‘tens upon tens of thousands’ of people. Thanks are due to Rabbi Elchanan Shoff, author of V’Ani BaHashem Atzapeh, Birchasa V’Shirasa, and Paradise, for pointing out this fascinating source. Shu”t Sheilas Yaavetz (vol. 2: 147, 4 s.v. u’vhiyosi), Shu”t Levushei Mordechai (O.C. vol. 1: 127 s.v. v’ra’isi), Shu”t Igros Moshe (O.C. vol. 3: 63), and Shu”t Chelkas Yaakov (new edition, O.C. end 207), similar to the rule set by the Chok Yaakov (O.C. 453: 9). Others who cite this sevara include the Shu”t Melamed L’hoyeel (Shu”t vol. 1: 87 and 88), and Shu”t Seridei Aish (vol. 2: 37, 2; new edition vol. 1: 50). The first mention of such a sevara seems to be the Zeicher Yehosef (Shu”t O.C. 157), who writes that b’shaas hadchak one may eat ‘she’u’it’, green beans, on Pesach due to this logic. [However, it is important to note that he only utilized this sevara to be lenient in extenuating circumstances. Also the Shaarei Teshuva (453: 1) seemingly and directly argues, writing simply that they are kitniyos and thereby prohibited.] See Vayaged Moshe (17: 7) quoting the Tiferes Shlomo (Ohel Shlomo vol. 1, pg. 35), that we should give hoda’ah for the fact that potatoes were discovered after the Gezeiras HaGaonim. See Shu”t Levushei Mordechai (O.C. vol. 1: 127 s.v. a”d) and Halichos Shlomo (Moadim vol. 2, Pesach Ch. 4, Dvar Halacha 28). This is a very important factor, as the Levushei Mordechai writes that although there are several reasons mentioned for the kitniyos ban, the most important one is that Kitnyos look similar to grain and get mixed up. This would obviously exclude potatoes from the kitniyos category. To paraphrase the Pri Megadim (O.C. 464, E.A. 1), No one, not even a blind person, would mix up a potato with a grain kernel! Halichos Shlomo (Moadim vol. 2, Pesach Ch. 4, Dvar Halacha 28). However, Rav Shlomo Zalman personally was stringent with potato flour [starch] (ad loc. footnote 109). It is known that the Badatz Eidah Hachareidis of Yerushalayim were also stringent until the renowned Minchas Yitzchak became the Ga’avad and ruled that there was no reason to be machmir, even with potato starch. Other Poskim who explicitly permit potato starch on Pesach include the Aryeh D’vei Ila’i (Shu”t, Kuntress Avnei Zikaron 10, based on the Pri Chodosh’s hetter - O.C. 461: 2 regarding matzah meal), the Levushei Mordechai (Shu”t O.C. vol. 1: 127) and Shaarim Metzuyanim B’Halacha (117: end 7 s.v. v’ugos). See also Shu”t Maharshag (vol. 2, O.C. 119 s.v. u’metchilla) who, as a side point to the main issue discussed, mentions as a davar pashut that there is no problem, even of Maris Ayin, regarding using potato flour on Pesach to bake. Thanks are due to R’ Moshe Langer for pointing out this important source. On the other hand, although the Arugas Habosem (Shu”t vol. 2,O.C. 124) cites several sevaros lehakel, he nevertheless concludes that it is assur, based on the similarity of baking use of potato starch and chometz. Additionally, the Chayei Adam’s stringent position on potatoes was based on the fact that a flour can be made from it, and leshittaso, that is the biggest problem with kitniyos. See Chayei Adam (vol. 2, 127: 1) and Nishmas Adam (Hilchos Pesach, Question 20). Shu”t Igros Moshe (O.C. vol. 3: 63; see also Rav Shmuel Kamenetzky’s Kovetz Halachos on Pesach, Ch. 10, 8, and footnote 9). Others who accept peanuts for Pesach include the Seridei Aish (Shu”t vol. 2, 37: 2; new edition vol. 1, 50: 2 - through a combination of factors), the Yeshuas Moshe (Shu”t vol. 1: 35; he opines that the kitniyos prohibition never applied to legumes that are eaten raw, but concludes similar to Rav Moshezt”l, that if one has an existing minhag not to eat peanuts on Pesach he still should not do so), and the Rivevos Efraim (Shu”t vol. 7: 257; only if it came still in its shell). [This logic is based on the Shulchan Aruch Harav’s understanding (O.C. 453: 5) that the prohibition of kitniyos only applies when it gets wet). Other Poskim who ruled that way (as how can kitniyos be more stringent than grain - which only can become chometz when wet) include the Chayei Adam (vol. 2, 128: 1) and Maharsham (Shu”t vol. 1: 183 and Daas Torah O.C. 453), who cites that Rav Shlomo Kluger zt”l (Nidrei Zerizin, 8) held this way as well. It is said (see Rav Ben Tzion Pelmanzt”l’s Kuntress Yemei Pesach pg. 162) that the minhag in Russia and Lita was to eat peanuts on Pesach, and that Rav Yechezkel Abramsky zt”l would serve it to guests. The Yesodei Yeshurun (vol. 6, Maareches Kitniyos, pg. 421) cites an addendum to the Minchas Pitim that states that Rav Meir Arikzt”l (the remowned Imrei Yosher) also held this way. The recently published Aliba D’Hilchasa periodical (vol. 86, Kislev - Teves 5777, pg. 117: 129) quotes Rav Avraham Rubin’s Shu”t Nachal Ayson (vol. 1: 9), citing Rav Osher Yaakov Westheim of Manchester and Rav Avraham Gurwicz of Gateshead, who aver the same regarding pre-war Vilna, as well as testimony from an elder that the Aruch Hashulchan permitted peanuts as well. Based on this, the ‘Kedassia’ kashrus agency of London, and Rav Yaakov Landau zt”l, former Chief Rabbi of Bnei Brak, used to grant Pesach hashgacha on peanut oil. On the other hand, those who were stringent regarding peanuts include the Shoel U’Meishiv (Shu”t Mahadura Kama vol. 1: 175), Avnei Nezer (Shu”t O.C. 373 and 533), Maamar Mordechai (Shu”t 32), Sdei Chemed (Maareches Chometz U’Matza 6: 1), Lekutei Mahariach (Minhagei Leil Rishon of Pesach, pg. 21), and Pischa Zuta (Birchas HaPesach, 2: 8 and footnote 4). Sefer Rabbi Chaim - M’Hilchosav V’Hangagosav (pg. 8; as quoted in Aliba D’Hilchasa ibid.) cites an interesting story about Rav Chaim Kanievsky as a child who just came to Eretz Yisrael and the first time he ever saw a peanut, ‘not yet realizing that it was kitniyos’. This issue was also one of the points of contention between Rav Kook and the Badatz Hachassidim of Yerushalayim regarding the permissibility of sesame oil for Pesach; this will be discussed in an upcoming footnote]. See also Shu”t Atzei Halevanon (vol. 1: 18) who also permits peanuts for Pesach, yet based on his description it seems he is referring to a pistachio (as per the Yeshuas Moshe ibid.). See the Chida’s Birkei Yosef (O.C. 447: 14 and 453: 5) who writes that in Eretz Yisrael, already in his time (late 1700s) they were machmir not to use sesame oil on Pesach. An early Acharon based in Yerushalayim, the Mahar”i Chagiz (Shu”t Halachas Ketanos vol. 1, O.C. 150) ruled similarly. This is also cited by the Melamed L’hoyeel (Shu”t vol. 1: 87 and 88) in the late 1800s, that the minhag in Yerushalayim (Takkanas Yerushalayim) dating back to at least 5602 / 1842 was not to use sesame oil, nor various nuts for Pesach. See also the recently published Aderes Shmuel (Piskei Rav Shmuel Salant zt”l; Hilchos Pesach 113, pg. 117 - 118) that cites an article from Rav Yechiel Michel Tukachinsky zt”l published in the ‘Chavatzeles’ in 5655 / 1885 that the Gedolei Yerushalayim of the time, Rav Shmuel Salantzt”l, the Maharil Diskinzt”l, and the Lubliner Gaon (author of Shu”t Toras Chessed), Rav Shlomo Zalman Ladierzt”l, all took a stand and publicized not to use sesame oil on Pesach (and not as erroneously publicized earlier in different periodicals that the Maharil Diskin permitted it). In fact, in 5669 / 1909 there was a huge machlokes between Rav Avraham Yitzchak Hakohen Kook zt”l (at the time Chief Rabbi of Yaffo) and members of the Badatz Hachassidim of Yerushalayim, Rav Dovid Lipman Shuvakszt”l, Rav Yosef Yehuda Halevi Strasbourgzt”l, and Rav Avraham Hakohenzt”l, about the permissibility of using sesame oil for Pesach (as fascinatingly detailed at length, with the teshuvos of both sides printed in the plainly titled “Kuntress”). Although under his personal hashgacha for Pesach, Rav Kook was nevertheless informed not to let the manufacturers bring the sesame oil to Yerushalayim, as there it was always considered kitniyos. This is further attested to by Rav Yisrael Nissan Kuperstock zt”l in his Shu”t Ani Ben Pachma (26) in 5688 / 1928, that the leniency for sesame oil on Pesach was not accepted in Yerushalayim. An enlightening teshuva from that period, by Rav Akiva Yosef Schlesingerzt”l, detailing the above machlokes, as well as Rav Schlesinger’s lenient ruling and logic, was recently printed in Kovetz Moriah (vol. 388 - 390, Nissan 5774). Some opine that this minhag Yerushalayim dates back to the Talmidei HaGr”a, as it is well known (see Maaseh Rav 184) that the Vilna Gaon was extremely makpid with even considering seeds, as well as their oils, as kitniyos. See Shu”t Yissa Yosef (O.C. vol. 2, 111: 4) who writes that Rav Yosef Shalom Elyashivzt”l’s being machmir for cottonseed oil [‘Minhag Yerushalayim Shemen Kutna Kitniyos B’Pesach’ - see Orchos Rabbeinu (vol. 4, pg. 166: 49], is based on the Maaseh Rav. The Badatz Eidah Hachareidis of Yerushalayim trace their minhagim regarding kitniyos back to the Maaseh Rav as well (see their Madrich HaKashrus for Pesach, 5773 pg. 163, and 5774 pg. 172 - 173). It is known that Rav Moshe Feinstein zt”l was personally machmir for the Vilna Gaon’s shittah as well, and did not use cottonseed oil on Pesach. [See Shma’atseh D’Moshe (Pesach, Shemuos Moshe 453: 2, pg. 368), Mesores Moshe (vol. 1, pg. 149: 301), and Kuntress Yad Dodi (pg. 119, Hilchos Pesach, Question 53)]. This is opposed to the common American minhag to allow cottonseed oil for Pesach - based on the Shulchan Aruch Harav’s shittah (ibid.) that the kitniyos prohibition does not include seeds, and especially as cottonseed is inedible in its natural form. Many authorities including the Melamed L’hoyeel (ibid. ), Tzehlemer Rav zt”l (as cited in Rav Avraham Blumenkrantz zt”l’s annual Kovetz Hilchos Pesach, ibid. ), Rav Yosef Eliyahu Henkin zt”l (ibid. ), Rav Tzvi Pesach Frank zt”l (ibid. ), the Klausenberger Rebbe zt”l (ibid. ), and the Chelkas Yaakov (ibid. ), permitted it for Pesach use outright. Additionally, the many Acharonim who permitted other types of questionable oils for Pesach (see previous footnote) would certainly allow cottonseed oil as well. See Chok Yaakov (O.C. 453: 1), Elyah Rabba (ad loc. end 2), Pri Megadim (ad loc. E.A. 1), Ba’er Heitiv (ad loc. 1), Machatzis Hashekel (ad loc. 1), Aruch Hashulchan (ad. loc. 3), Mishnah Berurah (ad loc. 4), Shemiras Shabbos Kehilchasa (new edition ; vol. 1, Ch. 40: 92), and Mesores Moshe (vol. 2, pg. 101: 190). The Chasam Sofer (Shu”t O.C. 121) even feels that we should treat corn as a ‘chashash dagan’, suspected grain! Thanks are due to Rabbi Arnie Wittenstein for pointing out this essential historical fact. This author recently found in Rav Yitzchak Isaac Krasilishtzikov’s noteworthy Toldos Yitzchak commentary on the Yerushalmi [which quite incredibly, was written in secret over a period of 13 years in Communist Russia and subsequently smuggled out] (Challah Ch. 1, Mishnah 1, 1b s.v. v’hashifon), that he translates ‘shifon’ (rye; one of the five grains) as “corn b’laaz” (in the vernacular). See KashrusKurrents article titled “Quinoa: The Grain That’s Not” by Rabbi Tzvi Rosen of the Star-K, originally published in 1997, and the Star-K 2013 Passover Directory (pg. 52). As per cRc alertdated February 23, 2012: “In 2007 HaRav Gedalia Dov Schwartz, shlit”a, the Av Beis Din of the Chicago Rabbinical Council, issued a psak that quinoa is not considered kitniyos and therefore may be used on Pesach. Most of the quinoa comes from Peru and Bolivia and has been grown in areas where other (problematic for Pesach) grains were generally not grown. However, as the popularity of quinoa has risen, this is no longer the absolute case. This was confirmed this year by a Star-K mashgiach who visited Bolivia and found that barley does indeed grow in those areas. It was also recently discovered that some farmers cover their quinoa with barley and/or oats to keep the birds from eating the quinoa while it dries. Finally, there is a concern that the sacks used to transfer the quinoa may have been previously used to hold barley or oats. We have, therefore, determined that the only way to allow quinoa for use on Pesach is to track the quinoa from certain farms that are free from the above concern.The Star-K spearheaded this endeavor and sent a mashgiach to find such a farm. While they were successful in their search, it proved to be challenging from a practical point of view, as the company visited generally sells their products in large quantities. The Star-K has now worked with other companies to pack the usable quinoa into smaller packages, and several options have been approved for Pesach quinoa consumption”. As per the cRc and Kof-K, it is important to note that even the quinoa that is under Pesach supervision should be carefully checked before Pesach for any foreign matter (such as barley) before use. This can be done by spreading the quinoa out on a plate and carefully checking there are no other grains or foreign matter mixed in. However, this author has been informed by Rabbi Zvi Goldberg of the Star-K that if one purchases the quinoa for Pesach that is under their hashgacha, checking is unnecessary. Sappirim (vol. 25: Ve’Kasher Hadavar, July 2012, pg. 9). As elucidated later on in this article. Rav Dovid Feinstein’s opinion is stated in Kuntress Yad Dodi (pg. 119: Hilchos Pesach, Question 51). 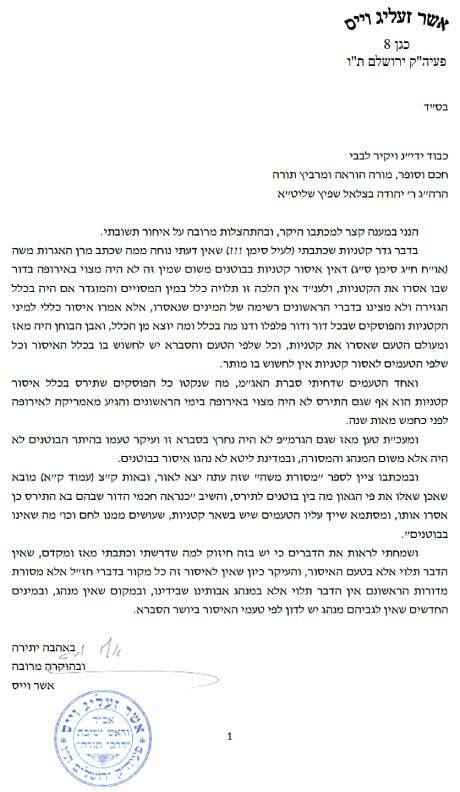 Rav Shlomo Miller’s strongly-worded letter on topic dated 2 Nissan 5775, was first published in Kovetz Eitz Chaim (vol. 27; Nissan 5777, pg. 95). Rav Westheim’s opinion was confirmed on March 5th, 2018 by direct communication. He writes “Regarding quinoa for Pesach, it seems to me quite clear that quinoa is in fact kitniyos and therefore cannot be used by Ashkenazim who do not use kitniyos on Pesach (and probably also not by those Sefardim who don’t eat all kitniyos for Pesach).” Thanks are due to R’ Yaron Shulman for facilitation. Although the OU’s other main posek, Rav Herschel Schachter, permits quinoa, until recently the OU did not grant it Pesach approval out of deference to Rav Belsky’s ruling.This is what the OU released about quinoa in the past: (http://oukosher.org/passover/guidelines/food-items/quinoa/):“There is a difference of opinion among Rabbinic decisors (Machloket Ha-Poskim) as to whether quinoa is considered kitniyot. Ask your Rabbi for his guidance. Additionally, while quinoa is not one of the five grains that can create chometz (wheat, oat, barley, spelt and rye), and quinoa is not grown in the same vicinity as the grains mentioned above, the processing of quinoa is sometimes done at the same location where they process wheat and wheat flour. It is highly doubtful that the mills are effectively cleaned between grains. The concern of wheat flour or particles finding their way into the quinoa flour would be a serious one”. Indeed, in an OU Kosher Pre-Pesach webcast on March 12th, 2013 (available at: http://www.yutorah.org/lectures/lecture.cfm/791649/Rabbi_Hershel_Schachter-Rabbi_Yisrael_Belsky/OU_Kosher_Pre-Pesach_Webcast_5773_%282013%29), after Rav Belsky and Rav Schachter state their opinions on the matter, Rav Schachter notes that although he personally disagrees with Rav Belsky, the OU still follows Rav Belsky’s opinion, and hotels under the OU will not use quinoa for Pesach. This author has also communicated with Rabbi Shoshan Ghoori, then of Aish HaTorah Chile, who had the unique experience of performing the quinoa investigation in the Andes Mountains for the OU. He presented the following information and findings after studying various growing and processing regions of the Andes: Since quinoa is a prized product both for export and for local consumption it is generally grown in large fields that are focused on just quinoa. He added that as quinoa’s popularity and prices rise, this point is even stronger. He has found that the traditional use of quinoa is not the same as the use of grains. It is not generally made into breads or other similar grain type foods by the Andean communities, but rather is an all around ‘super food’ used for soups, and teas etc., just like maca, canihua and kiwicha. After visiting approximately fifteen quinoa processing plants he has yet to have found one (not a gathering nor a washing station) that produces or mixes problematic grains (that could be an issue for chometz or kitniyos) in the same plant as quinoa. This does not mean that Rav Belsky had actually changed his position. In fact, this author has heard from several of his talmidim, as well as my father, renowned kashrus expert Rav Manish Spitz, who spoke with Rav Belsky directly shortly before his petirah, that he still personally did not recommend quinoa for Pesach use. This is also reported by his nephew, Rav Dovid Ribiat, in his recent Kuntress Hilchos Pesach - Halachos of Pesach (2015 edition, pg. 152) in a conversation on Pesach 5774, after the OU started Pesach supervision for quinoa. This author was not entirely surprised by the OU’s eventually permitting quinoa for Pesach use, as a contact at a Kashrus agency wrote to me in 2014 that “As far as U.S. psak, the Star-K, Kof-K, cRc Chicago, and half the OU (Rav Schachter) hold its not kitniyos, so it’s very strong and not likely to go away or become the minhag to assur. I think the OU will probably be mattir in future years based on Rav Schachter’s psak, but I am only guessing”. As attested to in a recent article in the OU’s 2019 pre-Pesach Daf Hakashrus (vol. 27, issue 3; March 2019) titled ‘OUP 2019’: The OU continues to give certification to Passover Quinoa. Quinoa will be available with an OU-P from Goldbaum, Pereg, and La Bonne. La Bonne and Goldbaum’s will also have OU-P chia seeds. Pereg will also be selling quinoa flour. As per personal communication with a CRC Kashrus representative on Jan. 17, 2017. He added that those who are meikil with eating kitniyos on Pesach (Sefardim) should make sure to only use quinoa with a reliable Pesach hashgacha, as it otherwise is generally processed in the same plants as chometz. Not to get confused with the Chicago Rabbinical Council (cRc) mentioned earlier, the Central Rabbinical Congress of the U.S.A. and Canada (CRC) is commonly referred to as the ‘Hisachdus HaRabbanim’ and is based out of Williamsburg, New York. As per an article on the COR website titled “Is Quinoa Quitniyos” (accessible at: http://cor.ca/view/159/is_quinoa_quitniyos.html); and in personal communication with Rabbi Tsvi Heber, Director of the COR. He wrote that while the COR will not change its shittah vis-à-vis its own certified establishments, it has decided to advise the tzibbur to consult with their own Rav regarding the status of quinoa. Badatz Eidah Hachareidis of Yerushalayim’s annual Madrich HaKashrus (Ch. 15, 4; ex. 5772, pg. 47; 5773, pg. 163; 5774, pg. 173). This can also be seen on pg. 38 of the 5773 Pesach Madrich HaKashrus by the listing of baby cereals which are permitted for Pesach use even though they contain kitniyos, such as rice, quinoa, and corn flour; and on pg. 133, quinoa is outright classified as kitniyos (pg. 143 in the 5774 edition). Thanks are due to Rabbi Tzvi Price for pointing this out. Although this author has heard differing accounts from various North American kashrus agencies as to what MV”R Rav Yaakov Blau zt”l, head of the Badatz’s hashgacha, held regarding quinoa, when I asked his son, Rav Chaim Yosef Blau (Mo”tz on the Eida Hachareidis and current Rav of Pag”i / Sanhedria in Yerushalayim) about his father’s position, he replied that he never heard his father discuss it, and that he would be quite surprised to hear that it would be different than the Badatz’s official position. See also Rav Dovid Lau’s Shu”t Maskil L’Dovid (end 15 s.v. quinoa) who reports that after hearing differing accounts as to Rav Blau’s shittah regarding quinoa, he asked him directly and Rav Blau zt”l replied that he never checked into the matter sufficiently to permit it for Pesach and when he was asked previously (over 15 years ago) he simply replied that “he did not know (anything about the topic)”. Thanks are due to Rabbi Naftali Zvi Frankel for providing this author with this important source. As heard from Rav Elyashiv’s noted talmid, Rav Nochum Eisenstein, Mara D’Asra of Maalot Dafna, Yerushalayim, and in personal communication with Rabbi Sholem Fishbane, Kashrus Administrator of the cRc. Rav Elyashiv’s position and his meeting with members of American kashrus agencies regarding quinoa’s status first appeared in the English Israeli Yated Ne’eman in 2006. Shiur delivered on March 6th, 2013 – accessible at: https://www.box.com/shared/a1y5cl7vio1x34ziwh6h. Rav Weiss also has written several teshuvos on topic, including one to this author – see http://en.tvunah.org/2014/03/23/quinoa-on-pesach/and Kovetz Eitz Chaim (vol. 27, Nissan 5777; pg. 92 - 95). As mentioned in an article by Rav Dovid Avraham Spektor of Bet Shemesh: . However, and although Rav Spektor personally concludes that quinoa is indeed kitniyos, following the above mentioned Rabbanim as well as Rav Elyashiv, he also cites that Rav Avigdor Nebenzahl of the Old City of Yerushalayim and Rav Dov Lior of Kiryat Arba are of the opinion that it is not, and is permissible for Pesach. Rav Spektor adds that in his opinion, if one normally eats quinoa every day for health reasons, he may rely on the mekilim and do so on Pesach as well, even though this does not fit into the classic category of an actual choleh. Shu”t Maskil L’Dovid (end 15, s.v. quinoa). He concludes that although quinoa is commonly referred to as ‘The Mother of All Grains’, nonetheless, since it is not an actual grain, it is still permitted for Sefardim to eat on Pesach. Rav Lau’s teshuva on kitniyos and quinoa is reprinted in the Rabbanut’s Madrich HaKashrus (Pesach 5774, pg. 47) as their official position on quinoa. Shu”t Igros Moshe (O.C. vol. 3: 63), see Kuntress Yad Dodi (pg. 119: Hilchos Pesach, Question 51), and Mesores Moshe (vol. 2, pg. 101, O.C. 190). This author was recently interviewed on the ‘Kashrus on the Air’ radio show, discussing both sides of the debate whether quinoa should be considered kitniyos. A recording of this show may be accessed at:https://soundcloud.com/jroot-radio/yosef-wikler-apr-07?in=jroot-radio/sets/kashrus-on-the-air.